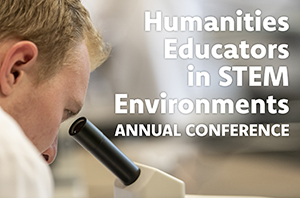 Indiana Tech will host the third annual Humanities Educators in STEM Environments conference on Tuesday, May 21 from 10 a.m.-3 p.m. There is no cost to attend and lunch will be provided. However, if you plan to attend, please click here to register. The theme of this year’s conference is Surviving and Thriving in STEM Cultures. Beyond survival, however, we want our programs to thrive: to engage students in required courses, promote connections among our programs and other disciplines, create meaningful relationships with STEM faculty and balance our identities as humanities educators with other identities we hold dear. In the spirit of honoring the myriad meanings of “surviving and thriving,” this year’s conference provides a variety of ways to share your research, knowledge, experience, concerns, reflections or questions. In addition to the traditional panels and individual presentations, we welcome proposals for discussion and round table sessions and poster presentations. Download the call for BIG or small Ideas to learn about the different ways you can participate. Submit your ideas no later than 5 p.m., Friday, April 12, to professor of English Susan McGrade at SEMcGrade@IndianaTech.edu. All ideas will be screened by the Humanities Educators in STEM Environments conference planning committee. Applicants will be notified of idea acceptance via email on or before April 19, 2019. If you have questions about this conference, please contact Cortney Robbins, Indiana Tech associate professor of English, at CRRobbins@IndianaTech.edu.